Now that Disney owns the Star Wars franchise, I am wholeheartedly expecting them to release as many games, toys, mugs, pizza cutters, and door mats branded with the license as humanly possible. Frankly, Disney would be an idiot not to cash in on Star Wars' mainstream and cult followings. 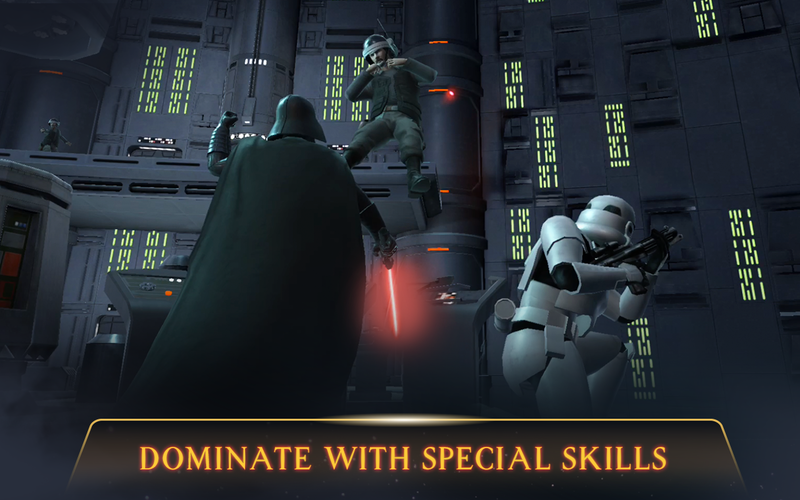 That is why it is no surprise to see the beta release of Star Wars: Rivals on the Play Store. It is also no surprise to see that it is a free-to-play corridor shooter rife with poor controls, repetitive levels, and loot crates that are explicitly tied to plenty of in-app purchases. 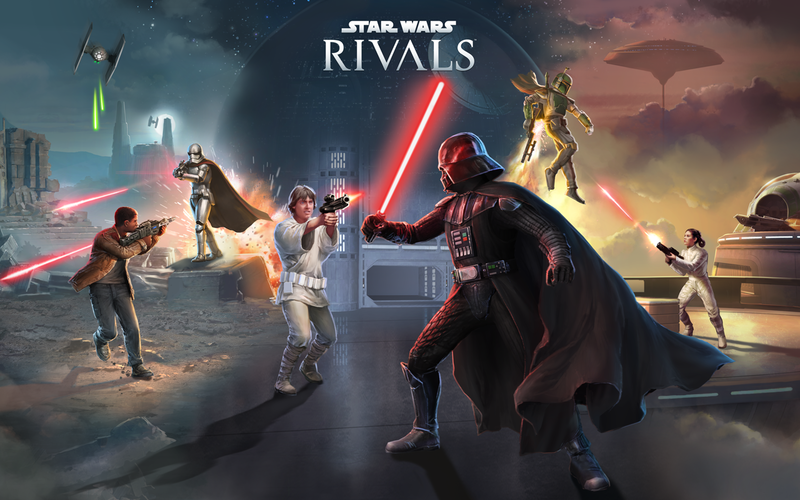 I would like to briefly mention that Star Wars: Rivals is currently a soft-launch title. Due to its unavailability in my region, I have sideloaded the APK in order to test the gameplay. There may be a few more adjustments to the game before it officially launches, so please take that into consideration when reading this hands-on. 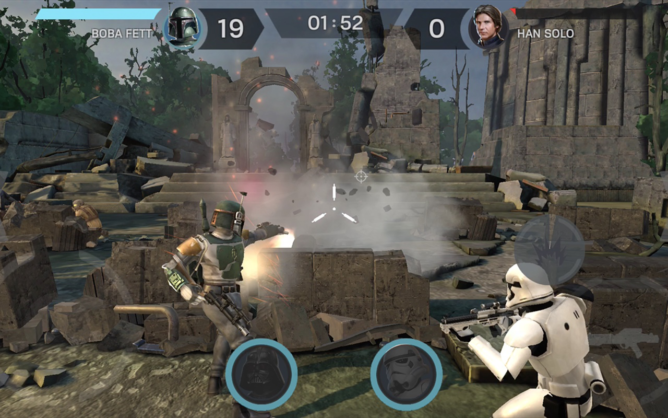 When I first saw the Play Store listing for Star Wars: Rivals I thought to myself that "this is refreshing, we now have a Star Wars game on Android that actually looks like a game." Sadly it seems that I was sorely mistaken. While at a quick glance it may appear that Star Wars: Rivals could contain some fun mechanics, in reality, it is just another dumbed-down grind fest focused on hero collection. What that means is that you are going to need to spend real money on the in-game currency of Crystals. These Crystals can then be used to purchase any number of things, including the game's loot crates. These loot crates are where you gain the main possibility to unlock new heroes. You see, you need 20 specific Data Tapes to unlock a particular hero. For $40 in Crystals, you can purchase an Ultimate Crate, which has 160 Data Tapes, with 70 of those earmarked for Ultimate heroes. While 70 Ultimate class Data Tapes sounds good, there is no guarantee you will even receive 20 matching tapes for a single Ultimate. So not only is the way you spend real money convoluted with the requirement of Crystals but then you have another layer of obfuscation with these Data Tapes. Frankly, I find this type of monetization sickening. It is pretty obvious that this is just a form of legalized gambling that is squarely targeted towards children. But hey, that's the modern Disney for you! Why make a worthwhile product when you can prey on children who have no understanding of money or how wrong this type of system is. Of course, there is also another way to earn heroes, but it will take a lot of grinding through the Arena. If you are wondering what the Arena is, this is where the game matches you up with other players in order to battle it out with three of your heroes. Right now there is an Arena event going on that will allow you to earn Boba Fett as a character. So obviously your options are pretty limited if you want to earn heroes through the Arena for free. When it comes to the gameplay, there is no real saving grace. Sure, some may consider the corridor shooting in this title passable, but really, it is just too repetitive. The poor touch screen controls also do not help make the gameplay any more enjoyable. The way the gameplay works is you have a hero (or three, if you are playing Arena mode) who has one conventional weapon, one powerful move, and a duck button for cover. While you aim with a touch pad on the left side of the screen, you choose from your three other options on the right. There are also buttons on each side of the display that permit you to move from one cover to another. This part is important as your cover can easily get destroyed, leaving you no option but to get shot up, or move on to another covered area. As you move around from cover to cover, you can aim at your enemies in order to shoot them with either your regular weapon or your power move. Both will have a cool down period, with your normal weapon only needing cooling if it is used with too much repetition. Obviously, you will need to balance how much you move and how much you shoot in order to stay alive. As you clear enemies from each area, you will auto move to the next, meaning the game is on rails in these instances. Once you clear a few areas, you will complete the level, to then move on to the next. You do this with extreme repetition until you die so often that you will need to upgrade your heroes. Upgrading heroes can be a bit of a chore. Luckily Disney recognized how ridiculous this system is, so they provided a FAQ. Essentially there are three different sections for each character that can be upgraded. First is your Rank. This is upgraded through 20 Data Tapes at a time. The second area you can upgrade your character is their Level. You level your character up with XP Boost. Sadly, not the FAQ nor the game explains where you get XP Boost from. Lastly, the third area you can upgrade your character is through Abilities. Each character has a few different ones, and you can upgrade them through the game's second in-game currency of Credits. You can earn these Credits while playing the game, but again, they are much easier to purchase with Crystals. Yep, that is correct. You can't buy Credits without first buying Crystals. This is yet another way Disney disguises how much you actually need to spend on this title. Now, I would be remiss if I did not mention Star Wars: Rivals' advertisements, in-app purchases, and lack of Google Play Games support. Luckily the ads are optional, so you do not have to worry about them getting in the way of navigating or playing the game. The IAPs, on the other hand, do go all the way up to $99.99 per item. With how heavily every item you need revolves around Crystals, it is pretty clear that you will have to spend quite a lot of real money to stay competitive. As for Google Play Games, there does not appear to be any support currently. Maybe this will change before the game releases officially, but I would not hold out much hope of that personally. 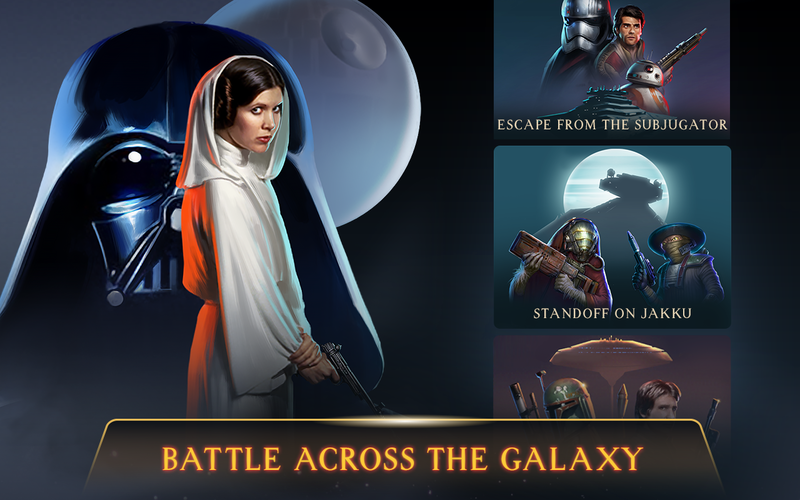 Ultimately Star Wars: Rivals is just another in a long line of free-to-play games on Android that are created from the ground up to milk the player as much as possible. Sure, there is just enough gameplay to keep you slightly entertained, but it is the collection aspects and upgrade mechanics that are designed to keep you hooked. 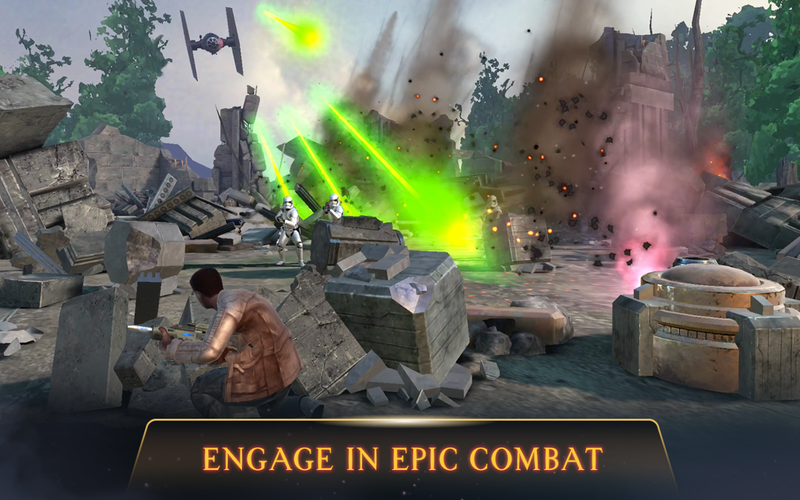 Sadly these areas of Star Wars: Rivals are so outrageously priced that it is going to be difficult for anyone without a ton of time on their hands for grinding to stay competitive for free. 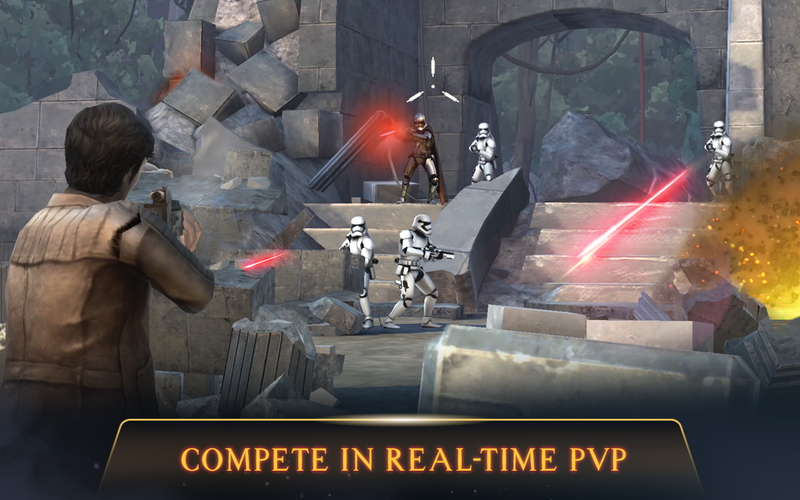 Considering that Star Wars: Rivals is billed as a PvP game, only those who spend the most money on loot crates will ever have enough powerful heroes to compete adequately. And so it goes, either spend a bunch of cash or settle for being the cannon fodder that entertains those who do pay up.